This course satisfies the Florida Board of Nursing requirement to earn 2 contact hours in Prevention of Medical Errors each renewal cycle. "Thank you for...this book. It is a topic I probably would not have chosen to pursue, but (I) actually found it to be quite informative and (it) helped me to see things from a different perspective." "Although the media is putting pressure on healthcare to decrease costs, this is not really applicable for nurses. Nursing does not START this kind of change. However, maybe nursing SHOULD be more involved in making changes. I LOVED the Lean philosophy that everyone is involved! Despite the "heavy" reading this course should be required for hospital and clinic nurses. I read the book cover-to-cover, re-read a LOT of it and did a LOT of highlighting." "I initially approached this study with some skepticism. Every quality improvement plan in the past has been focused on blame. I actually reread the text as I think many applications can easily translate to the critical care area. As long as the management does not fully embrace Lean, it will not occur without a culture of blame." 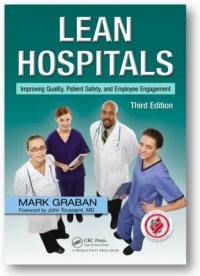 "I highly recommend this text for nursing as well as management. The principles of Lean must flow from the top down to ensure full participation."